(Above photo: Dueler Coil Shock on Nomad Carbon) Well, it is a natural progression to replace my air shock with coil version. 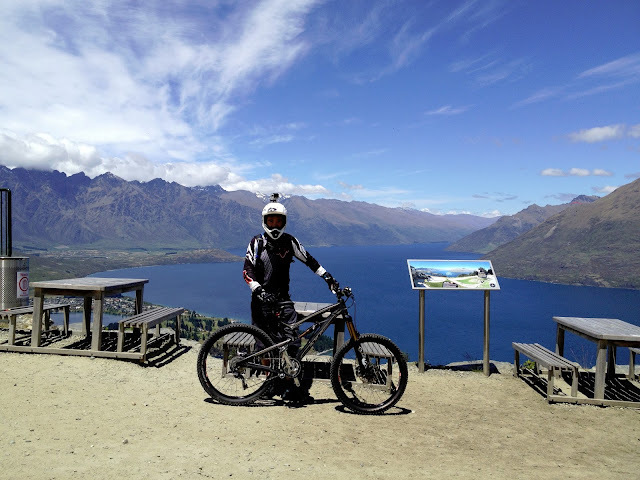 Somehow, the euphoria you enjoyed during downhill can be enhanced with a respectable coil shock, although I have no complain on my reliable Fox DHX air shock. I was deeply poisoned by the numerous literatures and reviews I read about CCDB...the ability to tune with great precision according to your riding styles and the identification of sweet spot that will blow you away. Honestly, it takes great biking skill for someone to enjoy the full potential of CCDB as it has boosted to be. Although I may not be the one, the psychological effect of riding the best coil shock may boost my confident when there is a need to trust your faith to do an untested jump or drop. Thinking that I was ready for the coil, getting the best coil shock was a natural choice. Supporting LBS and ability to enjoy local support motivate me to facebook the only LBS that carries CCDB. My excitement was immediately wound down when they were unresponsive to my queries. I began to worry about the long-term support. Refusing to give up, I dropped by the LBS and insisted on getting the CCDB for my Nomad carbon. To my disappointment, the LBS was only keen to sell the newly launched cane creek air shock, and refused to fulfill my needs for CCDB coil shock. 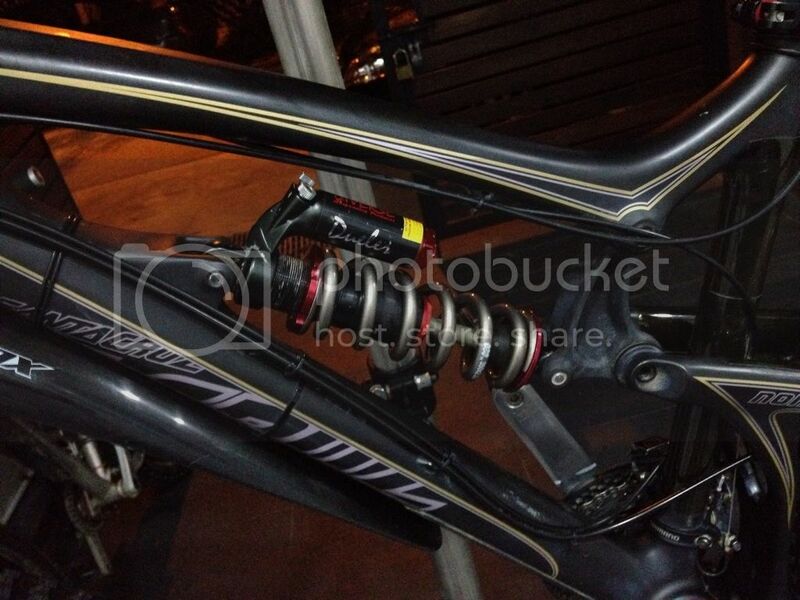 I was puzzled when told that cane creek need to customize the shock specifically for my nomad carbon. I was even more disappointed when told that it will take 6 weeks for shipment to arrive if I insisted on getting the CCDB. What can consumers do? Cane Creek online store only sell CCDB to US residents, what choice do I have? (Above Photo: Dueler Coil Shock) Knowing my plight, Dennis from DSP racing recommended me the Dueler Coil Shock, which has similar characteristic as the CCDB except the double barrel mechanism. Dueler has all the adjustment I am looking for: high and low speed compression; rebound; spring preload and bottom-out (air pressure). To my surprise, it comes with a titanium spring as standard! All for about S$600, significantly less than CCDB. I was quoted S$850 by LBS for steel spring version of CCDB, and they not even keen to sell me the ti version. 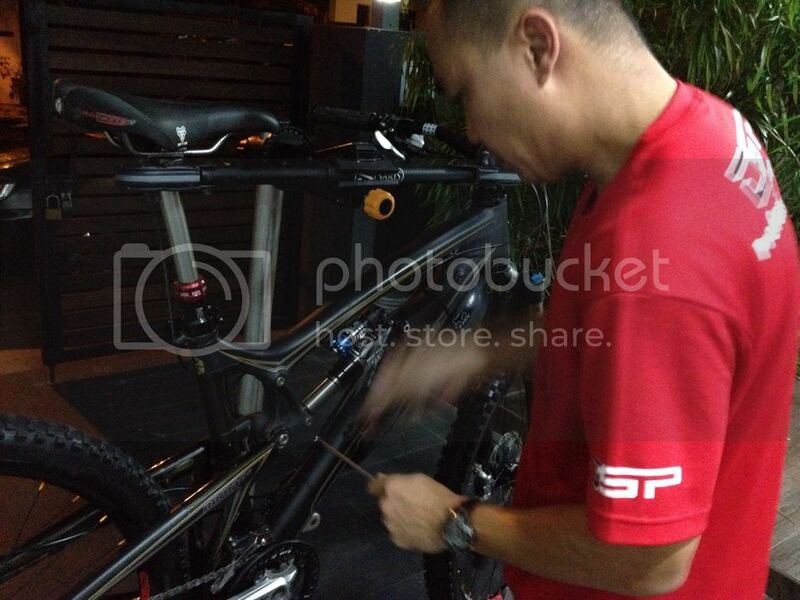 (Above photo: Dennis from DSP Racing removing my Fox DHX air) One day, Dennis posted on his facebook that he was offering riders free testing of dueler coil shock, which was unprecedented in local scene. As if I have not been surprised enough, Dennis actually delivered the dueler coil shock to my house, installed it on my Nomad carbon and got me to abuse the shock! What else could you ask for in term of service delivery? I put my hat down for him. I tried my best to abuse the shock outside my house: doing some bunny hops (er...need to polish up my skill), pedal push over the curb of the road, riding down the staircase, and hopping aggressively as I rode along the road. Although my Nomad carbon become heavier with coil, it trade-in for stability and confident. The initial feel was good, and the bounce is more linear and predictable. For a start, Dennis adjusted the shock setting to maximum plush. The intention was to tune upward to identify the sweet spot for my style of ride. However, the best way to test the shock is on the trail. Dennis has offered me to test it on Butterfly and Woodcutter trails. Tampines bike park was on the card too. The service alone already won over my heart to get the Dueler coil shock. 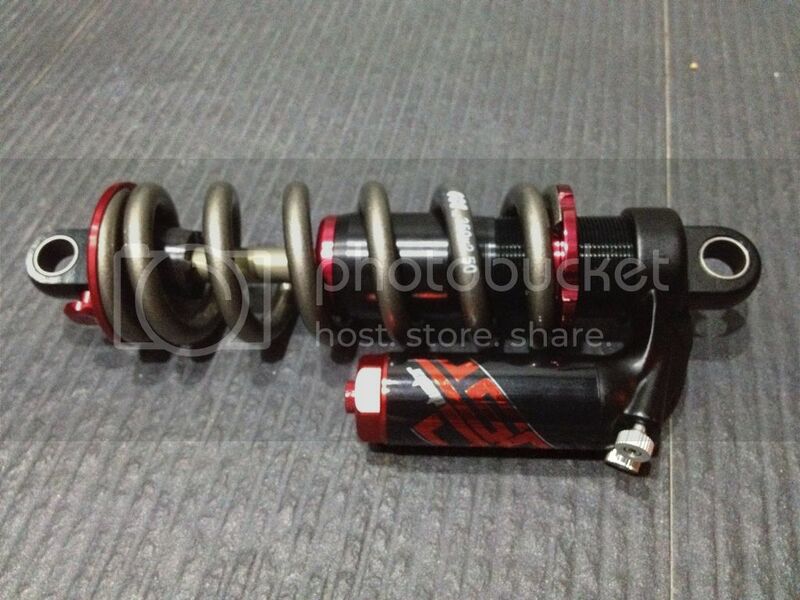 I will put up a more detail review on the Dueler coil shock once I tested it to the fullest on local trails. As for the CCDB, I can live without it! Hey Chris - did you ever do a long term review of the DSP Dueler? I've got a Nomad and thinking about this shock for my bike.... unfortunately being in Australia i can't find a distributor. Interested to know what you thought etc. Feel free to email me - iainlark@gmail.com it would be much appreciated. Happy trails. Hi Iain, I did not get the chance to do a long-term review of the DSP Dueler. However, I got the opportunity to use the same ti-coil (made and compression) on both the Dueler and CCDB on my Nomad. In comparison, CCDB is more responsive and sensitive than Dueler. Having said that, it is a matter of preference and the type of rides you normally do. The Dueler is a good choice in term of good value for money. Dennis is freelance. He is the point of contact in Singapore for DSP. If you keen, give me your mobile or email, will get him to contact you. Hi Chris. My name is Elson, contact 9798 6075 / elsonlch@yahoo.com. Thanks bro!